Henry Cavill News: Historic Photo Shoot: What Secrets Does Clay Enos Hold? Historic Photo Shoot: What Secrets Does Clay Enos Hold? Apparently it was history in the making today involving the main players in Batman v Superman. It all started when cinematographer Larry Fong shared a behind the scenes photo of photographer Clay Enos at work. But it was Enos' reply that really got us excited. When we reacted with glee, Enos made sure we didn't go too far with our excitement. @HenryCavillNews Please don't over interpret things. Justice League, etc is long way away. Fingers crossed I get to work that too. But then he added a bit more that put us right back where we started: joyous exhilaration! @HenryCavillNews Thanks! You'll see it all eventually. It's a long, fun road and the legions of fans sure make it worth the effort. Sorry Clay, we can't help it.. especially after these follow-up tweets from Fong and Henry's trainer Mark Twight.
.@ClayEnos Not gonna lie; I got a bit of the chills there for a second. 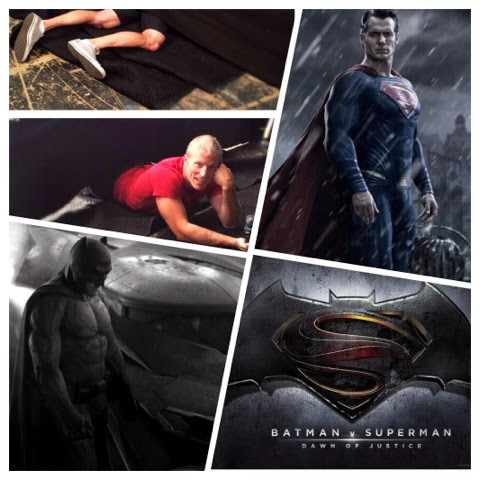 @ClayEnos It was a pleasure to witness a true visual craftsman at work. GAH. Later Enos once again reiterated that it's going to be a while, before we see whatever he shot. @HenryCavillNews I'm not being cryptic. We're filming now. Vis-fx takes another year. BvS is in 2016. Next year's con should be epic. And we'll be in San Diego to cover it for you! -- So what do you think was shot this weekend and who was involved? Exciting times ahead! Nice job HCN getting the inside scoop.